The Mercedes C-Class and the BMW 3 Series have been slogging it out for decades to get you to part with your hard earned cash. If you want a plug-in hybrid estate variant the decision just got a whole lot easier. Mercedes makes one, BMW doesn’t. The Mercedes system uses a slim electric motor integrated into the 7 speed automatic gearbox. An additional clutch allows the electric motor to power the car independently or in combination with a 2 litre turbocharged direct injection petrol. A modest 6.2 kWh (net) lithium-ion battery provides enough juice for between 11 – 19 miles of pure electric running with the system reverting to hybrid after this point. The combined system provides a mighty 443 lb ft of torque which fires the C-Class to 62 mph in just over 6 seconds. In pure electric mode performance remains strong with a usefully high top speed of 81 mph allowing you to run in EV mode anywhere. To help you to maximise electric running the system can use a sat nav route to decide when to recharge, save or use the battery. It can also make suggestions to the driver through the haptic accelerator pedal which provides pulse points to suggest lifting off to coast up to a car in front, and a resistance point to tell you when further application of the accelerator will start the petrol engine. If you want more control you can select E-mode, E-save, or Charge manually in addition to all the usual drive configurations of gear change speed, suspension, accelerator and steering settings. The system is also capable of ‘sailing’ where the petrol engine is de-clutched to allow the car to roll at speeds up to 81 mph. By using the radar system the C-Class can decide when sailing or regenerative braking is the best option and also when to trigger the haptic accelerator to maximise the effect. 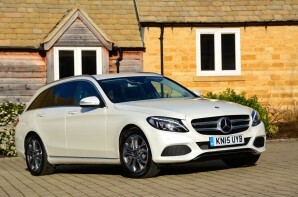 The plug-in C-Class is a technical tour de force, but it isn’t perfect. It is a shame that you can’t eke a few more miles out of the battery as we reckon that 30 miles of EV range would cover more people’s daily routines more of the time, and it just falls into the most expensive VED category. Finally it does give away some boot space to accommodate the batteries; with 350 litres available it is more of a match for small family hatchbacks than a full size family estate.